To create a Backlog board, please, use a quick add menu by clicking + icon near the search bar and choosing Board option. 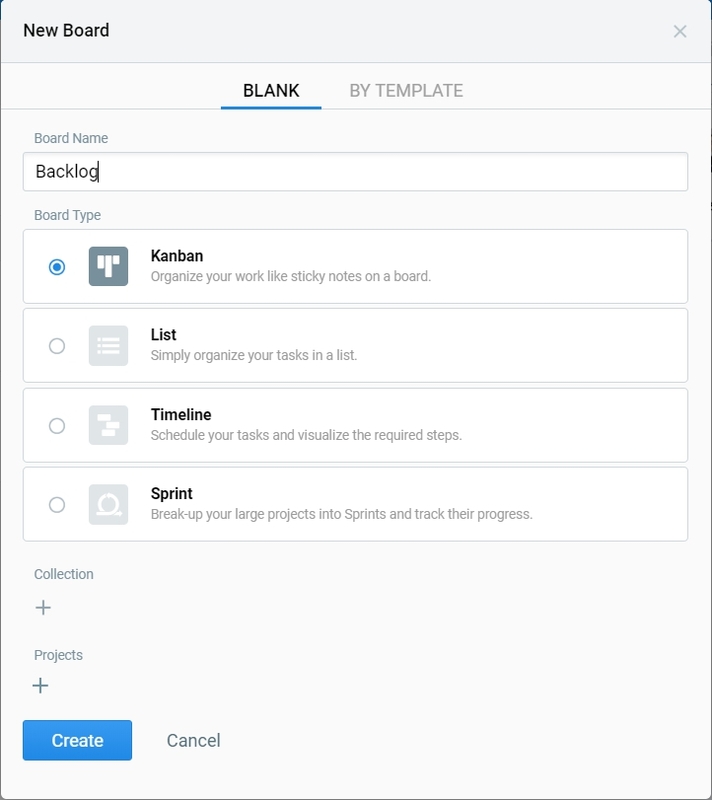 Then choose Blank > Board Type > Kanban. Task on a backlog board has its specific additional parameters: efforts&value. Comparing efforts&value combination of each task helps you prioritize the tasks better and easier and choose the most important tasks for development. To evaluate the task choose the Rate option on the right menu of the task and specify estimated efforts and value for the task. These parameters can be changed when necessary. To make sure you don't miss any task and leave it unrated, you can use quick filters No Efforts and No Value. These will help you keep an eye on all the tasks. Besides, you can always rate the tasks on a Backlog Chart. Tasks in the column can be sorted by efforts or by value. To sort them choose the Sort Tasks option in the column menu. Another backlog-specific feature for a task is a Push option. Push is basically a copy action, though both the original task and a created copy have links to each other inside. To help you easily manage your Backlog and quickly send the ideas from the Backlog board directly to development, you can try the Push All Tasks option. There’s one useful feature on Backlog board that will help you track a development stage of your idea. It’s a Push option. It allows you to send a task from a Backlog board to Sprint/Kanban board for its implementation with a help of task link. The pushed task is linked to the original one from a Backlog board which shows you its development status. With a help of tasks link pushed items will be automatically synchronized. Once a pushed task is completed and moved to the Done column, its parent task will be automatically moved to Done column on a Backlog board. This connection also work backwards. You can link a task from development board to a task on Backlog. You can push several tasks to different boards at the same time. For example, you gathered all the requirements and created an Epic or a Story and splitted it to 10 tasks for a realization. Some of them can be pushed to a Sprint board, the rest - to a Kanban board. After the push, you can see the cross links in a parent and copied tasks. This helps you to track the status of the epic/story and their subtasks. Usually you should have 3 sprints planned ahead so you can create 3 columns for each of them. I.e, the columns on your Backlog represent future iterations. Once you are ready to launch a new sprint, just Push All Tasks from a certain column to a board where your development is happening, with no need to manually add those tasks. These items will be automatically linked between each other. Priority Chart is a visual representation of a backlog board. Using the chart you can easily define priority and minor tasks and thus optimize the tasks. To switch from the board to the chart find the Chart button near the board name. The chart screen will open above the main screen. Chart screen is divided into 2 parts: the list of the tasks and the chart itself. You can drag the tasks from the list to the chart manually. You can also add new tasks from the chart view without switching back to the board. The Add Task button is located in the lower left corner of the chart. Please mind that you can only set the task's position and its title, not a description. Quick Wins – ideas with a really high value and low efforts. These are the low-hanging fruits that should be worked on immediately. The earlier you finish the earlier you will get results. Big Bets – ideas with high value and efforts. You may do them in the second place. They will take more working time than Quick Wins but they will bring the same profit. Try to break down these features into smaller, bite-sized tasks and remap them against other features. Maybes – these features offer lower value for customers but are easy to implement. They are great fillers which can be slotted in when there are small amounts of downtime, or between larger features. It’s also a great way to ensure continued momentum. Time sinks – ideas with low value but significant effort to deliver. Whilst still offering some benefits to the customer these shouldn’t be prioritized at this point in time. With the help of the filters you can choose to see all tasks or only the tasks belonging to a certain column. You can also sort the tasks by applying the sorting order. Maybe I'm looking in the wrong place, but I can't find the following 'sorting option'. Should it be available through the triple-dot-menu on the top right corner of a column? Tasks in the column can be sorted by efforts or by value. To sort them choose the Sort Tasks option in the column menu. On Pushing Tasks: does the following differ from linked tasks on a Roadmap Board? Because changing a task's status on a Roadmap to 'done' doesn't seem to move it to Done column on the backlog. to Done on a Backlog! Sorry to keep you waiting with the response! Indeed, the sorting option is about to be implemented soon.